Shopping cart abandonment is frustrating. If you feel like your abandoned cart rates are out of control, you’re not alone. Eight out of 10 eCommerce visitors who add an item to their cart will leave the store without buying. You don’t have to just sit back and accept that your abandoned cart rate is going to stay at 80%. If you’re looking to reduce shopping cart abandonment for your online store, keep reading. 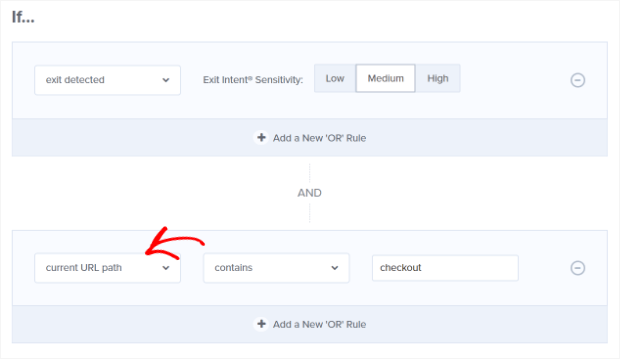 We’ll show you how to recover MORE sales with exit intent offers, plus the exact emails smart marketers use to bring abandoning shoppers back to complete their purchases. To get started, let’s take a look at Shopify’s built-in abandoned cart tools. Shopify has some basic features to help you with abandoned cart recovery. You can review abandoned carts one by one, and send an abandoned cart email manually or automatically. 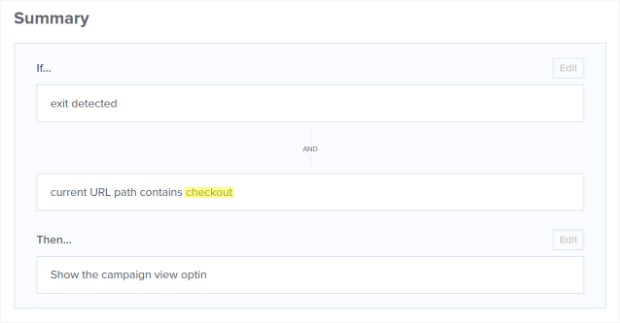 To see abandoned carts from your Shopify admin page, you simply go to Orders then click Abandoned Checkouts. 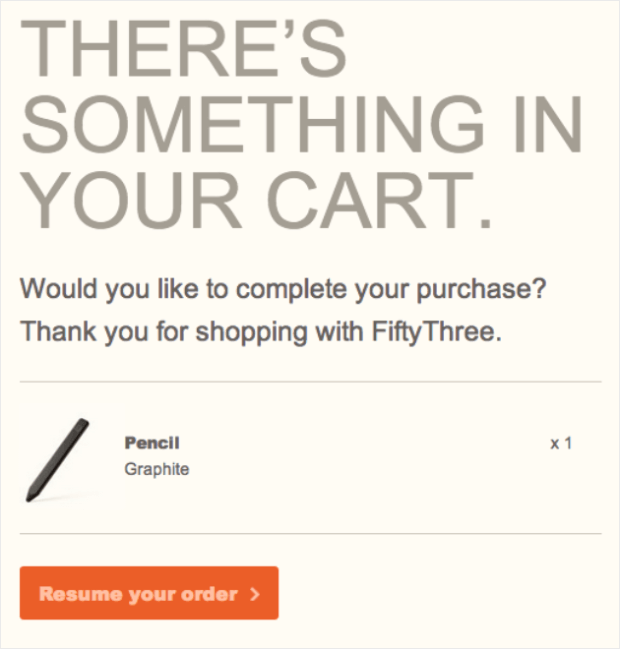 If you want to send a personalized email to a particular customer about their abandoned cart, Shopify lets you do it. From the Abandoned Checkouts screen you just click on the checkout number you want to recover and click Send a cart recovery email. Then just enter whatever message you want and click Review email to review and send your email. Sure, you could use Shopify’s built-in tools to do some of this, but do you really have the time to do this manually every time? Maybe a better question is do you want to do this manually every time? At its core, Shopify is an eCommerce platform, not a total marketing solution. To get the most out of their stores, smart eCommerce site owners use Shopify apps to recover abandoned carts and boost sales. 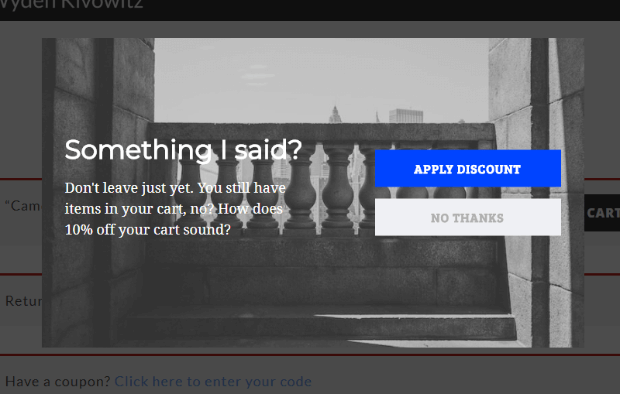 Let’s start by exploring the easiest way to reduce cart abandonment: an exit intent popup with a coupon offer. Picture it: a potential customer has been browsing your site and they find a great product. They put the product in their cart and go to the check-out page. Things are looking good for a sale when your would-be customer suddenly heads for the exit. With Exit-Intent® technology, you can once again capture their attention with a targeted offer that pops up to entice them to finish checkout. 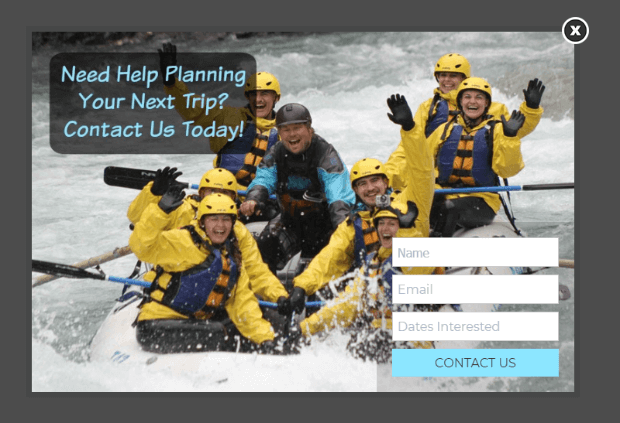 Using a simple exit intent offer, Wild Water Adventures was able to convert 160 leads and increase sales by over $60,000. Here’s another example: SnackNation uses this exit intent offer to convert 31.85% of abandoning visitors. This campaign works for SnackNation in large part because people love getting free stuff. 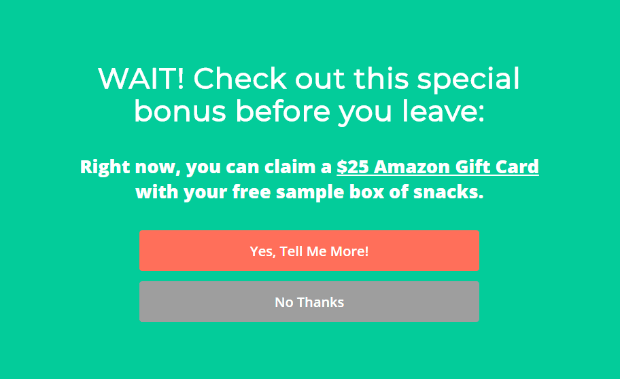 Here, you get to try a free sample box of snacks and get a $25 Amazon gift card; that’s pretty hard to turn down. Let’s take a look at one more example, Scott Wyden Imagery. Scott Wyden Imagery uses an understated black and white photo as the backdrop for this exit intent offer that converts 21.06% of abandoning visitors. Your eyes are immediately drawn to the bright blue Apply Discount button. The contrast of the blue button with the black and white makes you just want to click it, doesn’t it? If you want more inspiration, check out these exit intent popup examples. Ready to create your own exit intent offer to capture abandoning visitors and boost your revenue? Let’s do it. OptinMonster makes creating your own exit intent offer really easy. You don’t have to be a graphic designer to create something brilliant and high-converting. Click here to get started with OptinMonster, then follow the tutorial below to boost your sales. First things first, you need a campaign. If you need help creating or editing a campaign, check out this step-by-step guide. 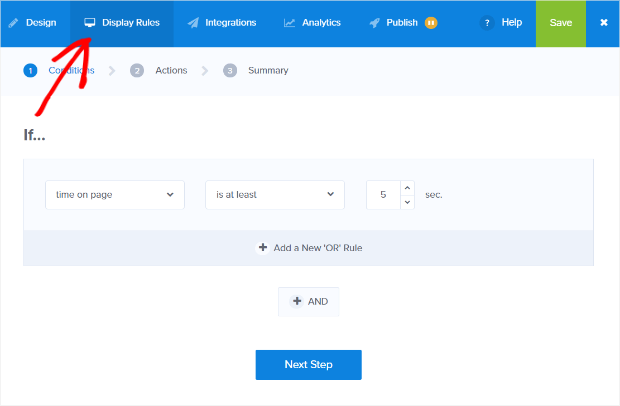 You can choose a template (or start from scratch) and then customize the campaign using the drag and drop builder. After you’ve finished your design, select the Display Rules tab at the top. Next, in the Conditions section, set a rule to Exit detected. Now we need to make sure that this exit intent offer only shows up on the checkout page. To do that, we’re going to add a new condition to our display rules by clicking the + AND button under our existing exit detected rule. Embedding your new campaign on your Shopify site is easy. Just follow this tutorial. Now that you have an exit intent offer to reduce your cart abandonments, let’s turn our attention to winning back the shoppers who still abandon their carts. If you want to recover even more revenue, you really need to be collecting email addresses and sending abandoned cart emails. A smart way to do this is to create an exit-intent popup to get email addresses and then automatically send a series of 3 abandoned cart emails. You’ll be offering a discount only in the final email. Sometimes people just get busy and forget to check out. Or, maybe the boss came in before they could complete their purchase and they had to leave in a hurry. No matter why they’ve gone, your first cart recovery email should remind them of what they’ve left behind. Great, right? It has the feel of an email you’d get from a friend. There are no images in sight. Bearbrand just uses a P.S. to call out a product that the shopper left in their cart. 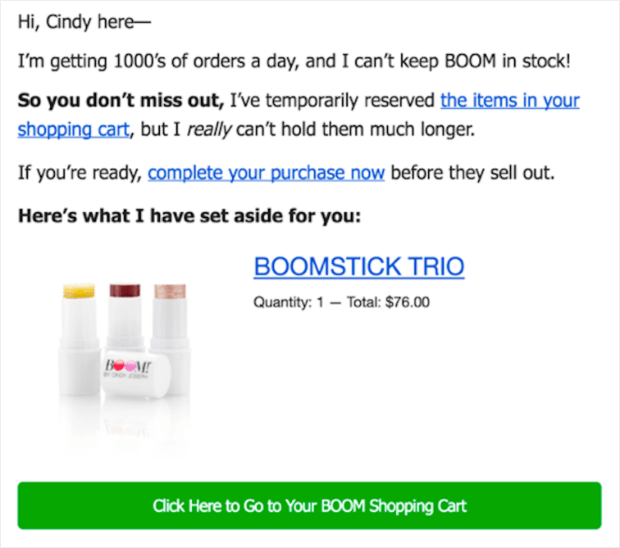 The second email in your sequence will be more assertive and create a sense of urgency, as Boom by Cindy Joseph does in their abandoned cart recovery email here. Your third email is all about the discount or offer. Have you ever been browsing an online store, happily adding ALL the things to your cart only to realize when you go to check out that you’ve gone a bit overboard? Sometimes “sticker shock” is enough to make a shopper abandon their cart. While you should try other cart recovery tactics first, offering an incentive like free shipping or a discount on the abandoned order can sway your particularly stubborn abandoners. 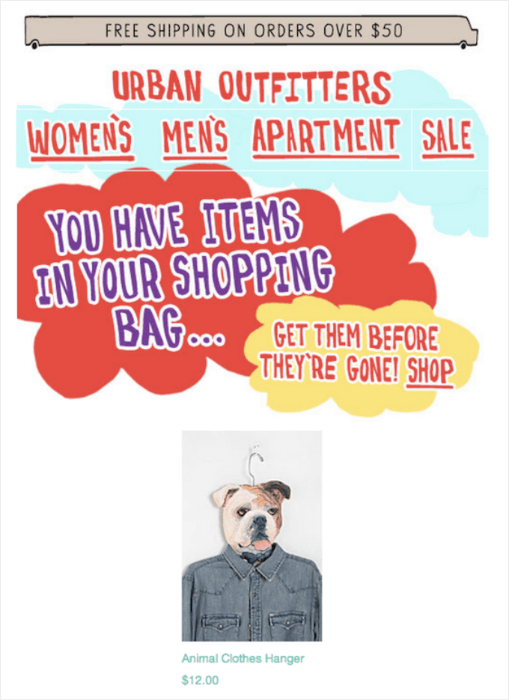 This offer of free shipping from Urban Outfitters comes packaged in a gorgeous and eye-catching email. The email includes a few elements that make it a great abandoned cart recovery tool: a reminder, urgency, and an image of what you’ve left in your bag. Wondering what’s the best timing for your abandoned cart email strategy? Send your first Shopify abandoned cart email within 10-30 minutes of cart abandonment. Don’t delay. Abandoned cart emails sent within 1 hour of abandonment have excellent conversion rates (20.3%). Waiting a day to send the first email can cut conversions by over 50%! Second emails going out within 24 hours of abandonment can also see great conversions (17.7%). Remember that this is the conversion rate for a second email after you already sent one the day before. 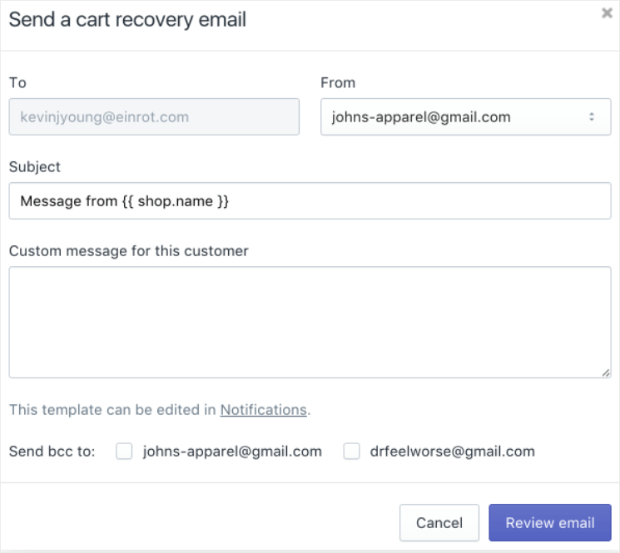 Opinions vary on when to send the third email in your abandoned cart recovery sequence. Some experts believe that your third email should go out 72 hours after abandonment. Other experts, like Ezra Firestone of SmartMarketer.com, believe that the best sequence is to send 1 abandoned cart email every day for at least 5 days. Do you know what this sounds like? A perfect time to do some A/B testing to see what works best for your specific audience. That’s it! See our complete guide to reducing shopping cart abandonment for more ideas, or follow this tutorial to create an in-cart upsell popup next to boost sales even more. And, because knowledge is power, arm yourself with these cart abandonment statistics and find out how you can use them to help you win back those so-called “lost” sales. Ready to get started recovering abandoned carts and making more sales today? Click here to get started with OptinMonster today!